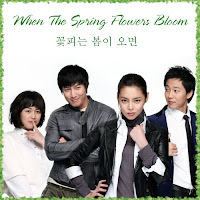 This song is performed by Lee Ha Na in When Spring Comes. LHN sings it beautifully. She’s really talented. Enjoy! Even though I was young and didn’t know much. But I understand it now what it means to leave. She left like a dandelion. Park Shi Yeon got injured while filming an action scene for When Spring Comes, and it sounds serious too. In a related note, last year, Eric Mun, who is PSY’s boyfriend, was seriously injured on the set of the drama Wolf and was hospitalized. For those who don’t know who PSY is, click on “Drama Info” and you can see her picture under When Spring Comes. She was also in My Girl. I wish her well and hope that she recovers soon. Bbashya, PSY sshi! News courtesy of yeohweping @ soompi and WITH S2, our “reporter.” Thank you for keeping us updated with the latest news from the K-entertainment world. Park Kun Hyung is selected to lead the Monday-Tuesday drama When Spring Comes scheduled to be aired by KBS2 in January, 2007, following the final episode of Queen of Snow. He plays the role Lee Jung Do whose grandfather and father were legendary thieves. Even so, he overcomes this obstacle, passes law exams, and becomes a prosecutor. His costars include Park Shi Yun, Lee Ha Na, and Lee Han. The filming is scheduled to begin in November. PKH’s previous drama was Miss Kim’s One Million Dollar Project aired by SBS in 2004. He also performed in movies Innocent Steps and Mr. Wacky. doozy: Lee Ha Na impressed me in Alone in Love so I’m excited because she’s the lead actress in this drama. Plus, there’s also Park Shi Yeon; My Girl support, ya know. I saw the first episode and it’s not bad. Looking forward to watching more of it.